Say NO to Mme Butterfly! The main building of the Gansen Urushi Studio is an old farmhouse. Foods are already prepared on the table in front of the house. 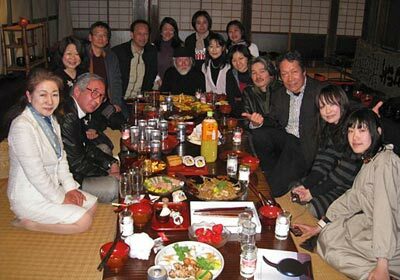 Last weekend I was invited by Professor Nagatoshi Onishi - I will call him "Onishi-sensei" in this article, because this is what I usually call him - and participated in a party held in his "Gansen Urushi Studio". 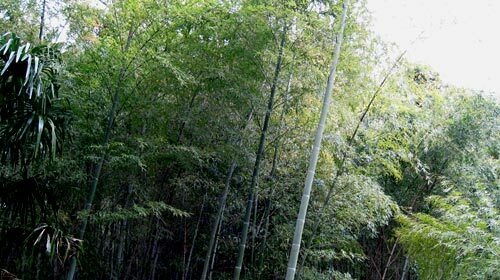 As Onishi-sensei explains on his internet site, "urushi" is adhesive and lacquer made from the resin of a special kind of tree - the urushi tree - growing in East and South-East Asia. 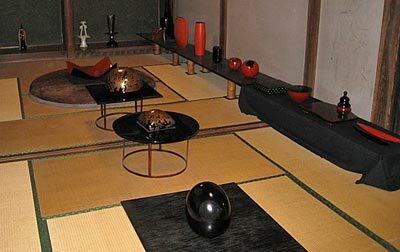 Though the lacquer ware made with urushi is called "japan" or "japan ware", urushi culture is common in Asia with all kinds of regional variation. 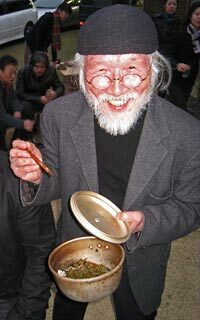 Onishi-sensei is enthusiastic about studying the urushi culture in its totality and to promote international exchange. I got to know Onishi-sensei in Copenhagen last summer, because he held an exhibition in the Danish Museum of Art & Design from July 4 to November 2, 2008. The same exhibition moved to Stockholm and can be seen in the Museum of Far Eastern Antiquities till April 13. 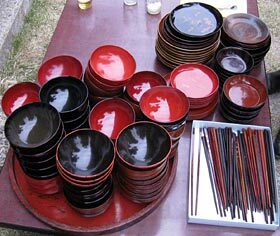 Lacquerwork plates, bowls and chopsticks for the party. But, they are not made in the Studio. 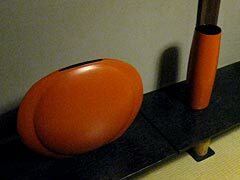 I was very surprised when I saw his lacquerworks for the first time, because they were totally different from what I had expected of urushi works. Onishi-sensei tries various styles. Of these, the representative style of Onishi-sensei is minimalistic and futuristic but gives an warm impression with its marvelous line, shape and color. They look to be very modern and geometrical. But, there is always a deviation from simple geometrical figures and this deviation creates warmth and itching charm. The surface is perfectly smooth but matt, which has some healing effect on me. The inside of the farmhouse looks like a exhibition room. but could be a Buddha. I am fully convinced by his explanation. I could really recognize in a small vermillion ball a Buddha, a smiling and friendly Buddha. 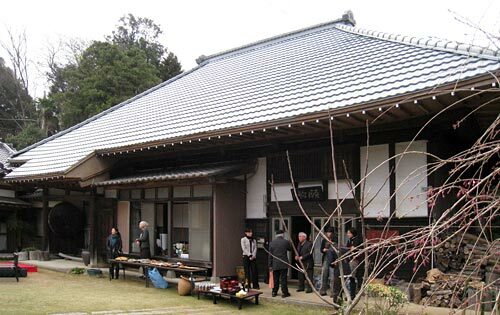 The name of the atelier "Gansen" comes from a word from a famous priest Shinran (1173-1263), who established the most influential Buddhist sect, Jodo-Shinshu in Japan. "Gan" means here Amitabha's promise to save people from the painful life of this world, the sea of suffering. "Sen" is a big ship sailing on the sea of suffering to save people and bring them to the paradise. "Sen" is a metaphor of Amitabha's endless mercy. Onishi-sensei himself does not belong to the Shinshu Sect, but he wants to help all the people who love urushi and are in need of help through "Gansen". "Gansen" is an old farmhouse, built in a small village at the end of the feudal period around 1860. Though it is located only 20 minutes' drive from Tokyo New International Airport, the village is suffering from depopulation, because young people do not want provincial life. It is regrettable. However, we have to admit that nowadays rural idyll hardly exists in the vicinity of Tokyo. If we try to preserve and live in an old house with thatched roof and plaster walls, we have to invest a lot, because traditional Japanese houses do not have modern comforts, their air conditioning is too inefficient and expensive and they are susceptible to fire and earthquake. Also the average income in the provinces is substantially lower than that in urban areas. As a result old villages tend to be maintained on a cheap budget, i.e. with ugly industrial materials and without paying enough attention to the aesthetic value of buildings or landscapes. In such surroundings it is a sort of salvation to find a place which is almost abandoned by the villagers. 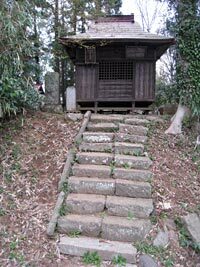 A small shrine appears to have been without repair for decades. Therefore, it appears to be about to collapse. But, the lack of cheap intervention makes it all the more beautiful. but played two small pieces of music - "From the lodging up North" and "Czardas a la Oka version" - on violin for entertainment. Some of us were allowed to meditate on his big disc. 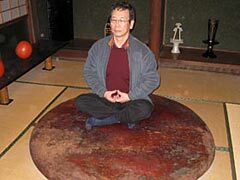 Onishi-sensei explained that it was indeed especially made for meditation on it. The diversity of his inspiration is beyond my imagination.